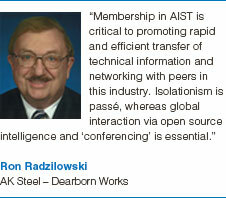 AIST’s 9 Technology Divisions include 30 Technology Committees that address specific process, engineering, equipment or reliability technologies associated with the iron and steel industry. Members who serve on Technology Committees become an integral part of a vital network to solve problems and advance the state of technology within the industry. Committee members must attend one meeting per year. Committee activities include plant tours, conference program development, industry surveys, roundtable discussions, technical presentations, and the development and maintenance of technical reports and benchmarking metrics.